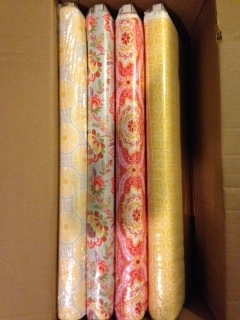 First Boxes Of Fabric Have Arrived! This past week my first two boxes of fabric arrived. It was like Christmas at my house opening the boxes and looking at the gorgeous fabric inside. The first box to arrive was from Birch Fabrics which sells the softest organic cotton and knit fabrics. I could not wait to try a yard or two. The second box was from Moda and it was so colorful, made me think of spring on a day that it was less than 30 degrees outside. I have been busy taking pictures and posting the fabric on my new Etsy shop at https://www.etsy.com/shop/SewOnTheEdge. My third box of fabric is due to arrive on December 2nd and it is full of the new Belle line from Amy Butler and fabric from Anna Marie Horner’s Dowry line. This fabrics would be great for making Christmas gifts. 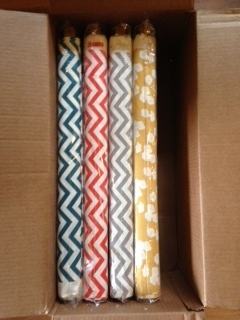 Box of chevron and poppie sun fabric from Birch. Box of sunshine! High Street fabrics from Moda.